During 10 years of consulting Fortune 1000 clients, Secure Digital Solutions (SDS) has pioneered what is now the industry’s leading methodology for improving information security programs. We call this methodology an information security Maturity Assessment, Profile, and Plan (MAPP). MAPP was developed in response to a CIO who asked SDS to provide a “clear, quick picture” of his organization’s security status and three-year strategic plan. After refining the MAPP approach, our team automated its implementation to create a rapid, repeatable and actionable solution. The resulting platform is TrustMAPP™, with an enhanced 3.0 version released in Fall of 2017. 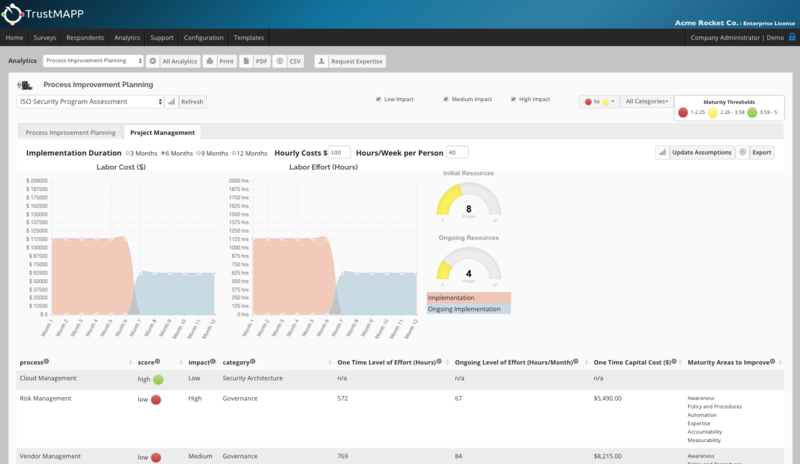 TrustMAPP is among the first instruments to assist with governance and management of information security, privacy, and compliance based on maturity dimensions aligning to risk. Configured with out-of-the-box templates based on with NIST Cyber Security Framework and ISO27001 as well as industry-specific regulations such as GDPR, HIPAA, PCI DSS, GLBA, FFIEC, FISMA, and SOX, TrustMAPP’s assessment templates rapidly measure the maturity of key business processes, mapped to multiple controls, across complex enterprises, using six maturity attributes measured on a scale of 1 through 5 for each process. A powerful analytics engine converts the data into recommended improvements, complete with capital costs and effort, enabling CISOs to develop precise plans and budgets, and clearly report the status of information security programs to executives and the Board of Directors. See a video introduction. Or request a custom demo and trial of TrustMAPP today.